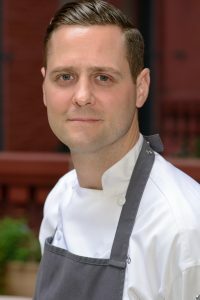 If you would like to learn more about Chef Brian Lockwood's bio, click here. How have your mentors helped you throughout your career? When choosing my mentors it was important to me to find and connect with an individual that inspired me in more ways that just professionally. For instance Chef Humm has inspired me to lead a better life through eating healthier and working out. To always strive to do better, never compromise and to keep extremely high expectations of yourself and your team. Chef Keller inspired me to hold high standards at home as well as in the kitchen. That excellence starts from within and it reflects in everything you do. What pieces of advice do you give your team? Do it for yourself. Don't do it just to impress your chef or coworkers do it because you love the craft of cooking and you'd like to get better. Becoming great is about doing the right thing when no one's watching. How do you continue to grow and learn more? Fortunately I work with some of the top professionals in our profession so my resources are incredible and that makes it easier to continue my growth. I think that keeping humble and realizing that everyone you work with have something to teach you is one of my keys to constant growth. Traveling and learning more about different places and cultures through their food is both fun and extremely educational. Being immersed in other cultures and exposed to other ingredients and ideas inspires me greatly. I also make an effort to dine out frequently to experience new restaurants.